Jason, I think you should start the "now really concise, I promise" autocollimator thread . I'm sure Jason has an article planned. We can discuss it here after it's released! ...a question:- It seems to me that the suggestion is that a 2" AC would be more useful than a 1.25" AC. In order to clearly identify the reflections, the wider AC mirror is better? True? ...I am still interested to hear your opinion about the following center spot shape. Seems to combine the benefits of a triangle and a ring--and should work well with a laser diffraction pattern too. With respect to 2" versus 1.25" AC, refer to the attachment. Top left photo represents P+3 (CDP) using a 2" AC -- actual unaltered photo. 1-	The view field is significantly narrower – even part of reflection P is missing. 2-	The AC background reflection is now getting on the way. Well, photo (A) is not what you would really see – I lied. What you will see is represented by photo (B) -- a dark background with only reflections P&1 showing. None of the other reflections or even the AC background will be showing. Why? The reason is technical but I will go ahead and explain it. In order for all other reflections to show, the AC pupil background reflection (shown by the red arrow) which is the center point of the AC background reflection (shown in yellow) has to fall within the AC foreground reflection (shown in cyan). In the bottom left photo, the red arrow did fall within the AC foreground reflection in case of the 2” AC. However, in case of the 1.25” AC in the bottom right photo, it fell outside the AC foreground reflection which means none of the other reflections will be seen. 1-	The field of view is significantly limited – this is an intuitive one. 2-	It significantly limits the amount of AC tilt before the view goes blank – not an intuitive one. Don't forget about how cool that center spot would look like because of its resemblance to the radioactive symbol. We can always brag about owning a “nuclear” scope. Your expectation from an autocollimator should be high. After all, the autocollimator is meant to provide that last extra precision above and beyond your other collimation tools. You might not get that last extra precision with an average autocollimator. But you will get that last extra precision with a high quality autocollimator. 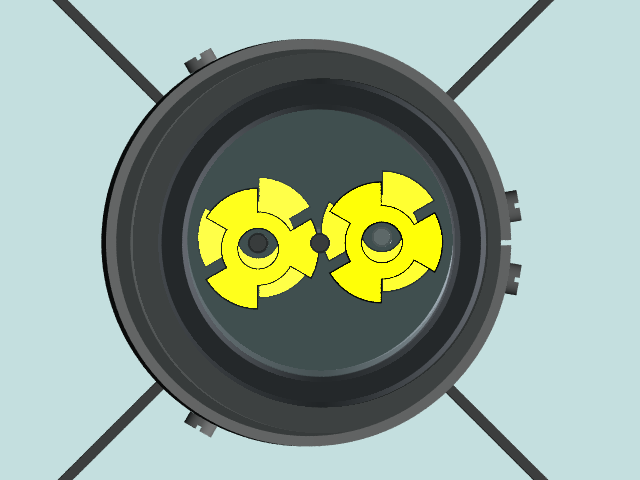 Of course, your scope mechanics need to be stable enough to take advantage of that extra precision. If, like me, you find your scope changes collimation with altitude, you will be on a path to perdition! I can't tell you how many modifications I made and how much time I spent tracking down the source of the collimation changes with scope movement. 'Twas the autocollimator that showed them to me. 90 degrees of movement with no change in the autocollimator. Learning to use the autocollimator taught me about scope mechanics. So, you see, the AC has more than one use. I'm only being a trace facetious. In fact, an AC IS a wonderful device for showing you where your scope needs a little souping up. In elimination of the sources of collimation drift, I ended up with a stiffer and better-built scope. All that from a relatively cheap tool. The "smaller tilt" requirement means that you need to bring collimation close to perfection using other collimation tools before the 1.25" AC can be used. The 2" AC is not as demanding. Just wanted for further clarify to others. With the 2" AC, you can tilt the AC enough to move reflections 1&2 away from reflection P&3 to be able to perform a good CDP focuser axial alignment. With the 1.25" AC, you can't because before reflection 1&2 move completely out of the way reflection 3 will disappear. You can use a smaller center spot to solve this issue, as Vic mentioned, but poorer readability of the smaller center spot and its reflections will compromise accuracy. Bottom line: If you are planning to invest in an autocollimator, it is highly recommended to get a 2” autocollimator as opposed to 1.25”. Vic, with respect to iterations between P+2 and CAM stacks, refer to the following page starting from post #3098491 to post #3098519 (6 posts). I explained how to reduce the number of iterations. With all this discussion about how the second pupil solves the disappearance act of reflections 2&3, I just wanted to clarify that it is possible to partially solve the disappearance act of these reflections via the central pupil but it would require changing the shape of the central pupil – reference post. Even though the triangular central pupil will solve reflection 2 disappearance act, reflection 2 will dimmer and jumbled with reflections 1&3. The 2nd offset will separate reflections 1&3 from reflection P&2 and show all reflections at their maximum illumination. Therefore, the 2nd offset is a better solution. Vic, with respect to iterations between P+2 and CAM stacks, if you refer to the following page starting from post #3098491 to post #3098519 (6 posts), I explain how to cut down on the number of iterations. Jason, thanks for posting the reference page. As soon as I get a chance to set up the 22, I'll give the XLK+CAM another run with special attention to offset lighting and implementing negative CAE. I'll see if the read issues persist, or if my XLK+CAM experience was just one too many reiterations and not enough patience on my part. Wow. I got a headache reading this thread the first time. Information overload but really cool. 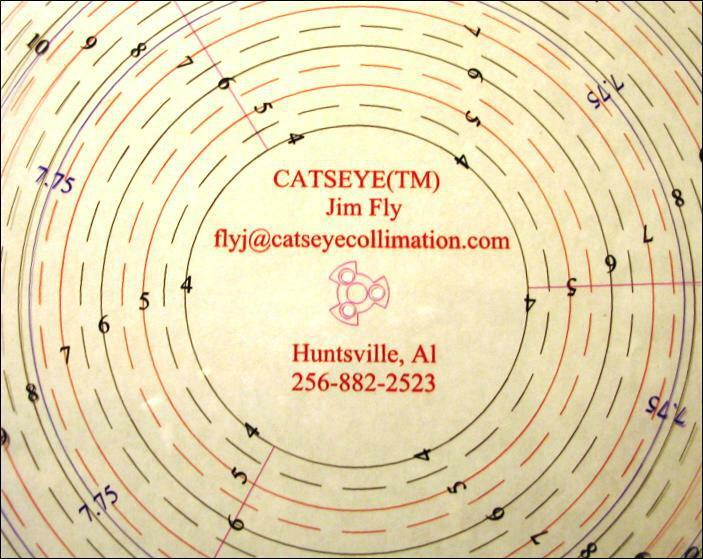 SO, I have the Catseye tools and use them for collimation. I actually enjoy collimating my scope (12XTI, F4.9) but the best I've done with the autocollimator is stacking two images. By that time I've gotten bored and just start looking at stuff. Everything looks fine, but I have to ask, if I go the extra mile and do everything in Jason's outstanding thread, would the images be noticeably better? I'm just curious. I collimate with the Catseye tools while it's still daytime and after the mirror is cooled, then do a brief collimation check at night with my Glatter laser and tBlug. So, once again, would I tell a noticeable difference following Jason's instructions? Walt, do you have the XL or the XLK version? Assuming you have the XL version, the instructions I included are not new. These are the instructions that Vic came up with and these are the instructions that Jim includes with his autocollimators. I just re-presented them with lots of photos and illustrations. Yes, you need to follow these instructions. I am referring to starting off with stacking P+3 stack (CDP) then stacking P+1 then double check with the cheshire and finally reiterate between the cheshire and autocollimator if you have to. If you do not follow these steps then you are not getting the most out of your autocollimator. As far as noticing the difference, this is a subjective question. I believe you will at high magnification when sky conditions are stable. A GENERAL COMMENT: If anyone has questions about the subjects covered in this thread, please ASK. Please do not be intimidated in case you can’t follow some of the posts in this thread. Please ASK questions to improve your knowledge and to benefit others. 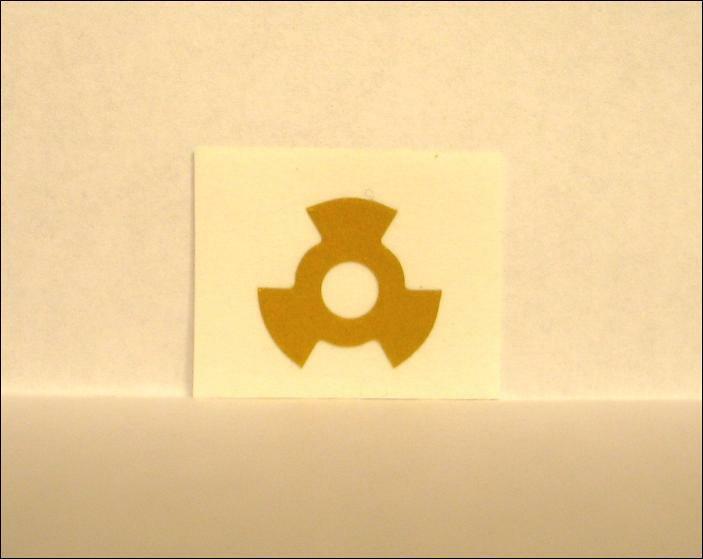 This post is more targeted for those with imaging reflectors. In multiple posts in this thread, it was clarified that when axial collimation is achieved the final view via the central pupil should include only the reflection of the primary mirror center spot against darkened background. However, those with imaging reflectors might be unable to get rid of reflection 2 no matter what they do and their final view via the central pupil will include a hexagram. 2-	The focal plane tends to reside above the focuser. 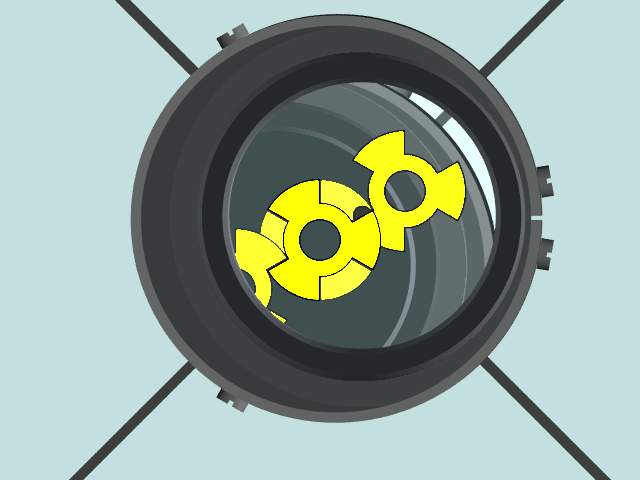 Combing both reasons above will place the autocollimator mirror significantly below the focal plane – in the neighborhood of >8% focal-lengths below the focal plane. When the autocollimator mirror is located significantly below the focal plane, reflection 2 and the background reflection of the autocollimator including the background reflection of the pupil will enlarge. When axial collimation is met, the foreground pupil reflection can’t fully eclipse the enlarged background pupil reflection which implies reflection 2 can’t be eliminated. Refer to the attached animation. The top row is for a normal case where the autocollimator mirror is placed at the focal plane (or within 2% focal-lengths from the focal plane). Foreground pupil reflection fully eclipses the background pupil reflection which is the reason why reflection 2 dimms then disappears. The bottom row is for the special case where the autocollimator mirror is placed significantly below the focal plane. Foreground pupil reflection partially eclipses the larger background pupil reflection which is the reason why the larger reflection 2 dimms but never disappears. 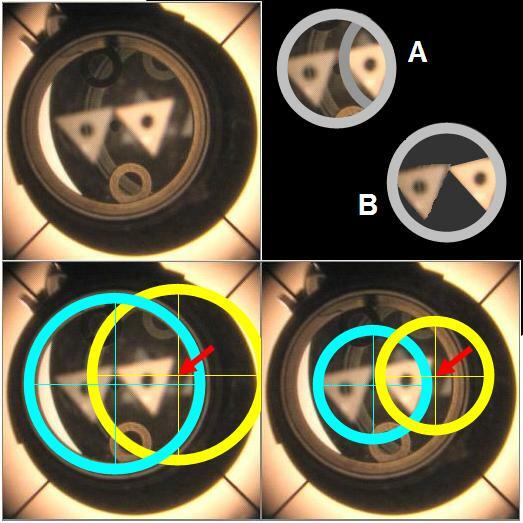 Those with visual reflectors typically will not run into this issue because their reflectors tend to have larger focal lengths and because the focal plane tends to be located within the focuser travel area which implies the autocollimator mirror will be located within 1% of the focal plane. Last year during an email exchange, Nils Olof Carlin referenced the radioactive symbol to clarify a point he was trying to make to me. Though we were not discussing center spot shapes, when the radioactive symbol flashed before my eyes I thought it would make a wonderful center spot. Earlier in this thread, I suggested the new center spot shape which resembles the radioactive symbol – refer to the left diagram. 1-	It shares the outer circular perimeter with the donut center spot shape for improved alignment with the cheshire. Refer to the middle diagram. 2-	It shares the 3 intrusions with the triangle center spot shape for improved P+2 & P+3 reflections stacking and for facilitating cheshire alignment (3 intrusions vs. 3 collimation screws). I believe it is even better than the triangle shape when stacking P+2 & P+3 in the sense it is more precise to visually complete a circle as opposed to forming a hexagram. Refer to the right diagram. Jim Fly recognized the benefits of my suggested shape. 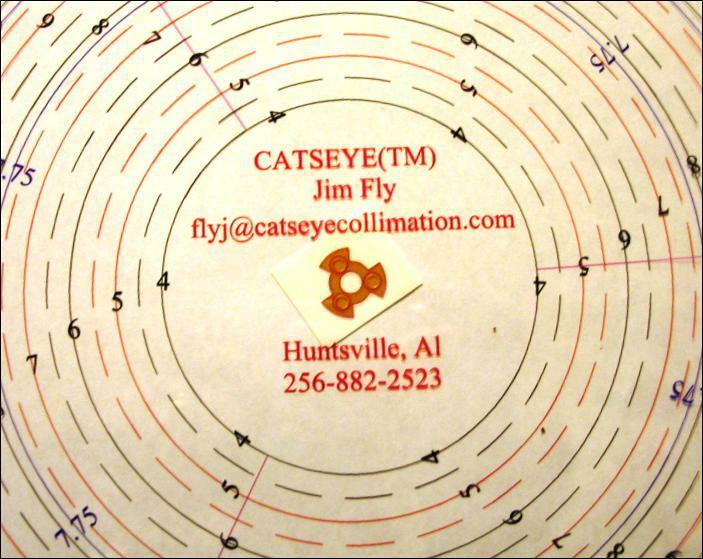 I was pleasantly surprised when Jim contacted me and informed me that he produced prototypes for the newly suggested center spot shape and offered me one for evaluation. Jim Fly called the new shape Hotspot. Few days ago, I received the Hotspot and the accompanied template. With permission from Jim, I am uploading few photos for the Hotspot and the template. You might have noticed that the color of the Hotspot reflective surface is dark yellow as opposed to the common White and Red colors. When I inquired about the reason from Jim, he explained that as the Hotspot combines the benefits of the donut and triangle center spots, it also combines the benefits of both the White and Red colors, hence, the dark yellow color. Interesting!! I am planning to replace my triangle center spot with the Hotspot and give it a test drive. I will publish my analysis and photos in a week or so. This is such fun to watch - the leading edge of new developments. I wait with interest, Jason. I am looking forward to give Hotspot a test drive as soon as possible; unfortunately, due to a home improvement project in my house, my scope is inaccessible to me at this time -- tucked away safely in the garage behind heavy pieces of furniture. I should be able to give Hotsot a test drive by next week. with permission from Jim Fly, I am uploading several POVRay simulations completed by Jim.